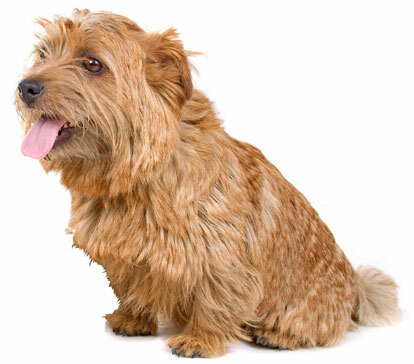 The Norfolk Terrier is lively, happy, alert, playful, outgoing and affectionate. He loves to curl up in bed with you, or to climb on the backs of sofas and chairs to see what you and the rest of the world are up to. He is loyal and becomes very attached to his owner, and needs the love and company of his family. He is not the kind of dog who can be left alone in a yard. If ignored, he will become bored and destructive, and can begin digging and barking. He needs human companionship. He generally prefers people to other dogs and pets, although he can get along well with dogs and cats if introduced to them while still a puppy. He is not good with very small pets, as he will hunt and chase after them. He loves people, and is very loving with children who are old enough to be well-behaved with him. He is feisty and fearless and a good watchdog. He keeps an eye on the world, and will bark if he sees something unexpected. He may sometimes bark too much, or make a funny screeching sound when he gets excited! But generally he isn't a yappy dog. He is a steady companion, though somewhat independent and stubborn when it comes to training. You will need patience. He is quite willing to please you but also strong-willed, and needs to be taught with consistency, confidence, and lots of treats and praise. He can be difficult to housebreak. He has a great deal of energy and needs to lead an active life. He needs a long daily walk, or else some exciting play time with the balls and toys he loves. He should always be on a leash when outdoors, or in a safely fenced area, because he will chase after small animals. He should be supervised when in the yard because he might dig under the fence and escape. He practically doesn't shed so he is a good pet if you are don't want to find hair in your home. The Norfolk Terrier is 9 to 10 inches tall (to shoulders) and weighs 11 to 12 pounds. He has a double coat consisting of a medium-length, straight, wiry outer coat and a soft undercoat. His coat color can be red, wheat, black and tan, or gray. His coat only needs to be brushed occasionally. Pet coat: Clipped short every few months. Show coat: Stripped (dead hairs plucked out) every few months. The Norfolk Terrier was developed in Eastern England and is said to be descended from gypsy dogs used to hunt vermin and chase fox. He shares his ancestry with the Norwich Terrier; both were probably bred from Border, Cairn and Irish Terriers. Both dogs were simply referred to as the Norwich Terrier (or more informally as the Jones Terrier) when the breed was perfected by a breeder named Frank Jones, and later became highly popular with students at Cambridge University. The two dogs were recognized as one breed, the Norwich, by the English Kennel Club in 1923. There was very little interbreeding between the two types after World War II, however, and by 1964 the English Kennel Club had designated the drop-eared variety as the Norfolk Terrier, and the prick-eared as the Norwich. The first Norwich terrier was registered in America in 1936. The two breeds were not separated by the AKC, with the Norfolk Terrier acknowledged as a distinct breed, until 1979. His AKC popularity was 112th out of 157 breeds in 2007.